The rate of change in technology presents challenges for all of us in our daily lives. Whether it’s the latest apps or newest phones, it’s a steep and continuous learning curve. For universities and colleges, the choices about how we use technology to educate students are many and the options potentially costly, in dollars as well as opportunities. Decisions about educational technology are among the most consequential. They affect the core of academic institutions: how faculty teach and students learn. 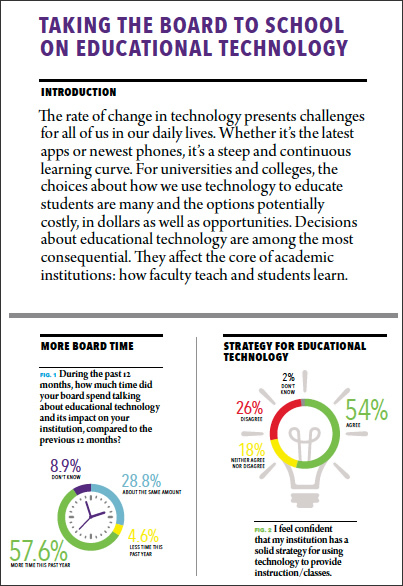 AGB conducted a survey about boards and educational technology in Spring 2013. We hope these data from AGB’s survey on educational technology help inform you and your board as you consider the impact of technology on teaching and learning at your institution.